Selling to C-level officers with decision-making powers in an organization is not an easy job for any marketer or sales professional. Approaching these executives require robust strategy and detailed knowledge of the concerned person to successfully go down the sales pipeline. Direct communication with C-level executives is far more productive than limiting to building conversations with mid-level officials only as the ultimate decision on whether to purchase or not lies in the hands of the top decision makers. Convincing the high-ranking officials such as the CEO, CFO, CIO and more is an essential part of your sales cycle. If you want to close the deal as early as possible then influencing the C-level officer (CxO) is vital for your business. Before striking a new conversation with any CxO, don’t forget to do your homework to prepare yourself for winning his trust and converting him to a loyal customer. Hence, rather than wasting your time in contacting subordinate officers, it’s better you approach the decision-makers directly, and for that, we provide you with a list of six practices that can help you polish your sales skills. Random targeting won’t be of any use for your business unless and until you make the extra effort to identify who the potential customers are from the industry. For marketing your products and services to decision-makers of any organization, you need first to find out whether they are interested in what you offer and want to hear from your brand or not. Apart from studying the ranks, patterns and other dynamics of your targeted organization, try to get hold of an accurate and well-segmented C-Level Executive Email Lists of the same company from a reliable email database provider. With the right contact details in possession, reaching out to the right CXO will become easier and faster. By gatekeepers, we mean that subordinate officers to the CxO who serve as the gateway to the decision-makers you want to target. Once you know whom to target, you need to be aware of who their gatekeepers are and find out ways to befriend them for reaching to your prospect without any delay. If you have a good rapport with these officers, then they can help you in building a strong relationship with the CxO and in closing the deal faster. Often by bypassing the subordinates to trigger their sales process, marketers end up annoying these intermediaries for which the consequences they face is not at all good for their business. Once you have identified your potential customers, the next step you need to take is doing intensive research on the C-Level executive. The areas of study include his background information, the issues that particular CEO is dealing with in the company along with other factors that drive his decision-making such as finances, competitors, customers, suppliers, operational drivers, etc. Before going ahead with the first conversation or meeting with any of the C-Level executive like Chief Executive Officer (CEO), Chief Operations Officer (COO), Chief Financial Officer (CFO), etc., remember to have a complete knowledge of the person concerned. As a sales person, you should be aware of the company’s position in the global market and the latest updates of that specific firm you are targeting. Only the most experienced and the best member of your team should be sent to deal with the CxO as the power of rejecting or accepting your offer lies in his hands. A small mistake done on your part can ruin all your efforts done so far. After all the research work you have done so far, now it’s time that you use it wisely while communicating with the particular C-level Officer. Don’t be in a hurry to start the sales conversation. Firstly, listen to what concerns the executive has and then offer your product as a viable solution to that issue of his. Your focus should be in making the conversation intellectually appealing as well as should address the purpose of the CxO throughout. Once you know what he is looking in for a product, strike him with innovative perspectives of how your offering can help him with a worthy solution. In the end, conclude the meeting with a discussion on the plan of action involving the C-level executive. When you are dealing with the top-level officials such as Chief Information Officer (CIO), Chief Administrative Officer (CAO) and others, you need to exhibit the credibility of your brand as a reliable business that they can trust. Winning the confidence of these executives is an essential part of building strong relationships with them. Content is undoubtedly the king in today’s digital age. An effective content strategy, when followed efficiently, can lead to greater conversions of leads into a loyal customer. By providing valuable and eye-catchy content in all the forms such as email, white papers, eBooks, newsletters, etc., you can keep the C-level executives engaged to your brand giving them enough reasons to initiate future conversations and close deals soon. Hence, it won’t be wrong to say that after all the effort you put in convincing a C-level executive to purchase your products, the outcome you get is worth all the investment. 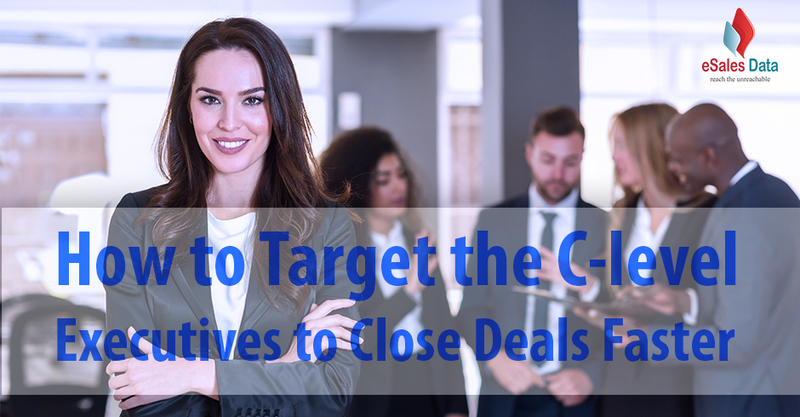 Finalizing the deal to the earliest is your priority, and so targeting the top decision-makers is the best approach you need to adopt.